Volunteer organization working directly with homeless and refugee families. Managing 8 houses and 40 apartments for over 50 families. Providing shelter, transitional and long-term supportive housing, food, clothing and furniture. Mary House relies completely on private donations. We receive our financial support from private individuals, foundations, churches, schools, local businesses and synagogues. While each family brings their own uniqueness to Mary House, so to are the financial gifts that we receive. Whether ten dollars or ten thousand dollars, each donation is a part of the fabric providing the safety net for families who are otherwise unable to move beyond the isolation and limits imposed upon them. 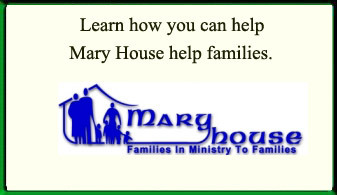 Mary House provides housing and other services related to the social and economic needs of homeless families, distressed women, and children. Mary House works predominantly with the low-income Latino population of Washington, D.C. We have no salaried staff; each of the five full-time volunteer staff, including co-founders Bill and Sharon Murphy who live at Mary House with their five children, receives room, board, health insurance, and a nominal stipend per month. Mary House provides housing and other services related to the social and economic needs of homeless families, distressed women, and children. Mary House has sheltered more than 400 families and has cared for hundreds more in its 29 year history. In one case, a family came to Mary House with six children from a one room basement apartment in Mt. Pleasant. The family paid $450.00/month to share a space with rats, no ventilation, and inadequate cooking facilities that included a hot plate for preparing meals. They moved into transitional housing, developed a month-to-month budget during the first year, and expanded to a twelve month budget plan during the second year. The mother began English classes and the father studied for the GED. After living in transitional housing, the family was moved into a larger apartment and the long term supportive housing program. The mother studied to become a licensed day care provider and father passed the GED. Currently, the family is applying to a low-income home ownership programs in the city. Mary House has an annual audit as well as an administrative budget of less than 3.2%. The Mary House Board of Directors is comprised entirely of volunteers who reflect the community we serve. In fact, two members of the Board are always former participants, while the other members include business and community focused individuals.